We all know that dogs are man’s best friend, and it’s natural that you might want your family companion to come along on your next vacation. While bringing the dog along does require some planning ahead, it will be a great contribution to the vacation, as long as the dog is comfortable, well-behaved, and most importantly safe. Follow these helpful tips the next time you travel with your dog! 1. Make sure that your dog is used to the car. You can let him sit in it without leaving the driveway, and build your way up to short rides. If your dog is comfortable in this environment, it’ll be much easier for him or her to bear a long car ride. 2. Once you’re off and driving, continue to make sure that your dog is comfortable! 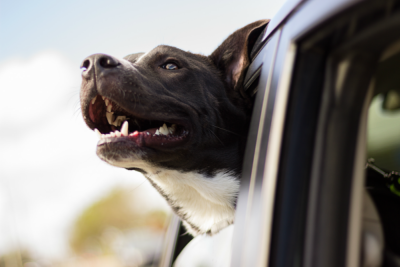 Avoid car sickness by letting your dog travel on an empty stomach, and make sure to bring along water so that they can stay well-hydrated. Keeping the car cool and ventilated is also important. 3. On the road, stop frequently! Your dog will need breaks to run around or go to the bathroom. 4. Double check with your hotel and/or accommodations that dogs are not only allowed, but that they will welcome your dog with open arms. Imagine the situation if you don’t communicate your needs and they are completely blindsided! 5. Buy a sturdy leash and collar for your dog, one that won’t break or fray apart. On the collar, put an identification tag with your dog’s name, your name, your phone number, and proof of rabies shots. Just in case something goes wrong, it’s important to make sure that your dog will be safe! You can also consider a more permanent form of identification, like a microchip. 6. Make sure that your dog is ready for this kind of trip! 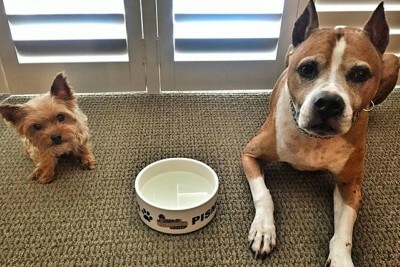 If you think they would love the adventure, but you’re worried about their behavior, spend some extra time training them or perhaps go to a dog training class. It’s important to not cause trouble for your hotel and accommodations so that they can continue to welcome canine guests. The following Martin Resorts hotels are dog-friendly: Paso Robles Inn, Pismo Lighthouse Suites, and Inn at the Cove! Learn more about visiting the Central Coast and staying with us here. Thanks for reading!